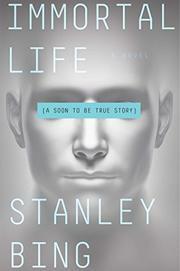 In a near future where corporations have monetized the world, a trillionaire plots a depraved path to immortality. The ever prolific Bing (The Curriculum, 2014, etc. ), the nom de plume of the publicity chief of a well-known media empire, here turns his sharp voice to a dystopian satire about the monetization of immortality and the costs inherent to it. The book’s villain is particularly vile—127-year-old Arthur Vogel is Earth’s richest man and a Frankenstein’s monster of implants and other life-lengthening techniques. But time is running out, and money is no object to Artie, as demonstrated by his penchant for 3-D–printed body parts. His personal mad scientist, Dr. Bob, has developed a way to capture and migrate personalities into the cloud: “Attitudes. Memories. Sense of self. Life story. The whole person. If it goes right, you’ve created digital immortality.” But pervy Arthur wants the whole package, so to speak, so he’s wiped the mind of Gene, an innocent man intended to be his permanent vessel. After merging with Gene, Arthur also makes plans to wipe out “The Committee,” the ruling body that oversees all remaining commerce in a devastated United States. But Gene still has friends in “The Peaceable Kingdom,” an enclave of Pacific Coast freedom fighters dedicated to the destruction of digital culture. Once his friends kidnap Gene, they find they can suppress evil Arthur’s personality with lots of booze. While Gene tries to keep Arthur at bay, his friends make plans to wipe out the cloud with an electromagnetic pulse. The plot sounds serious, but Bing uses a light touch, biting mockery of Silicon Valley culture, and grotesque imagery to good effect. But while Arthur brings true villainy and The Peaceable Kingdom has some interesting members, good guy Gene remains a cipher who’s a bit hard to pin down. A fitfully funny satire that mocks disruption culture while it questions the purpose of immortality.